Here’s the brilliant cover for my new picture book–DUCKWORTH, THE DIFFICULT CHILD–to be published in June by Atheneum Books for Young Readers, an imprint of Simon & Schuster. My illustrator, Júlia Sardà Portabella, is based in Barcelona and has done an astounding job on the artwork. Thanks also to art director extraordinaire, Sonia Chaghatzbanian, and my fantabulous editor, Emma Ledbetter! 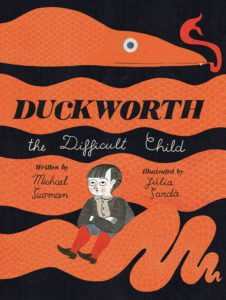 DUCKWORTH, THE DIFFICULT CHILD is available for pre-order at Amazon.